Anelka: Enfant terrible or man of principle? Nicolas Anelka has garnered praise and criticism throughout his football career. Is it ever right to challenge the status quo? Should you not say yes when you mean no? Should you ignore the consequences to question, criticize and reject that which you find unpalatable? Well, if you’re anything like Nicolas Anelka, you should. "Le Sulk," as he’s known, has just completed a typical period of extremes in which he was banned from international football for 18 games following his dismissal from the French World Cup squad for insubordination. His response was to laugh at the French Football Federation’s (FFF) public show of righteous indignation before promptly showing that he’s unaffected by their finger wagging. Two goals in Chelsea’s 6-0 defeat of Wigan in the English Premier League, followed by a mock act of contrition with Didier Drogba during one of the goal celebrations, suggested the Frenchman remains unbowed. Anelka, 31, is nothing if not an enigma. Eight clubs in a 15-year career points to a man who finds it hard to make friends and settle. And when you add to that the fact that acrimonious relationships, like the one he had with France coach Raymond Domenech, have become the norm for him, it’s easy to label him as a “problem”. Yet still big clubs, such as Arsenal, Real Madrid, Liverpool, Manchester City and Chelsea have sought to employ him. In fact, his collective transfer fees of some $140 million, make him second only to Cristiano Ronaldo in terms of the money spent on acquiring him. Why might that be? Well, to start with, he remains a prodigious talent, capable, when sufficiently motivated, of pace, power and artistry that make him a stand-out player even in a team of stand-out players. He also appears to be a man who stands by his principles, refusing to apologize to Domenech for his South African tirade because he still believed in the premise of what he said. That won’t change anyone’s view of him though, because, like Eric Cantona, Roy Keane, Diego Maradona and a number of other fiercely principled, opinionated individuals, Anelka’s reputation goes before him. It’s a self-fulfilling prophecy in which it’s easier and more convenient to put a negative slant on the things he says and does than it is to take the time to know and understand the player and his motivations. So, to many, Nicolas Anelka will forever be remembered as talented enfant terrible who refused to toe any line that, in his opinion, did not need toeing. And you know what? If he cares at all, I bet he wouldn’t have it any other way. He always says what he thinks and refuse hypocrism. He is proud and honest! Excellent assessment of the situation. Sadly though, principled people often do not go far in life. Good for Anelka, for his work and ethics speak volume. For many of us we are at the mercy of those holding the purse strings. We can never be as principled as him and millions other honest hearted individuals out there. Pity us! Domenech was a fool that should've never coached a team on a national level. Anelka simply pointed out that the emperor was was naked and had a dense aura. kudos Terry! Good analysis. Such characters in the game only brings some sort of flavour that makes want to stand and salute . Yes, it's going to make you stand on your feet and gape in astonishment, thinking they are from a different planet. His presence in Chelsea only brings invincibility to the team. Irrespective of peoples ill-feeling about Nicolas' style and percieve gross respect he's one excellent a player and Chelsea cuacus are ion love with him. The problem for the French team during the World Cup is and will be the fact that absolutely no one cared about Dominech. This was clear today... this was clear during the last World Cup, where Zidane LED the team. Furthermore, neither the FFF nor Dominech have taken responsibility for their mistakes, and instead handed out a silly ban to a player. No linguist here but shouldn't that be "L'enfant terrible"? What is so great about having principles? Don't you realize they are generalized if then do loops, that backfire in specific situations. Apparently the writer of this article can agree and condone actions of priciple for Anelka's personal benefit while treading on the millions who pay to watch him perform. Silly article. Being a selfish prima donna is just that. Lack of flexibility and social interest. Letting Domenech know for sure who is the alpha male in Anelka's space was the most selfish, unintelligent and uncontrolled thing he could possibly do. Please make it clear that a forum is moderated before people waste their time innocently posting comments that are never even looked at by the moderator. The world needs more men who are not afraid to speak up for themselves. The terrible referee decisions that cost big clubs money and games and go unchanged........and in a game its very bad when everyone on the pitch knows the ref is wrong. What we need to do as a team is to ALL walk off when that happens and then pay the fine etc BUT that will show we will not put up with it so they WILL have to bring in camera and upgrade technology ie goal line etc. Anelka can be seen as a trouble maker but I take the view of the author that he his entitled to do WHAT he wants WHEN he wants. The man is a very talented player and gifted but also stands up for what he believes in and that is something special in todays football. Would you be with the french trainer they had the 'games' he played and still plays with playrers heads. They do bear some responsibility but the main one is the man charged with motivating them to win and in that he failed . You have to understand that to play for your country and represent the people should be: an honor, and feed a purpose playing for a greater cause. Well, unfortunately deep inside Anelka's drive for self esteem and for many other players that play for France do not consider France to be their country. The driving patriotism is missing. They are raised and taught that their real countries, religion, and legion of valor lies and is Africa. that is the only subjective conclusion that i draw when i consider what happened to the French team. Anelka you're great!! stand by what you believe in! 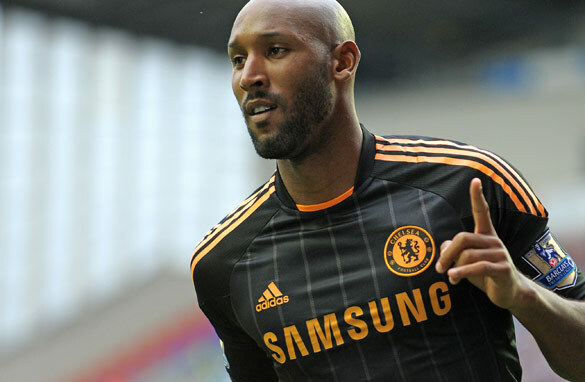 Wishing Nicholas Anelka all the very best in the ongoing 2010-2011 football season. Nicolas Anelka is a superb player n a person who tries to live by the book. I am impressed by Raymond who noticed that all the french where not motivated, I think that question should be put to the coach as the head of the mission. He might have been in a position which he deserved not. Anelka is a great player. Not only because he scores goals but also because he has heart. The French just picked him to make an example out of him. Obviously, they picked the wrong person because since he's someone very proud, he doesn't take crap home. He says what he wants when he wants. Come on people !!! As Raymond Domanech got fired, he asked 2 million Euros in damages to the FFF. What the hell is wrong with this picture ? The coach was the problem...too bad that he got sacked after the WCup and not before...now deal with it ! Good stuff.Objective analysis.Without players like Anelka, football might not be at its exiting best.For sure the FFF has learnt something from the situation, though might not accept openly. Anelka is a great player and I respect him... And of course noones respect Domenech, he is a shame for the France football! No wonder why the players doent want to respect him... He didn't want to sheke hands with the South african team coach after the match in the world cup... Domenech u should retire! Saw Anelka play for Paris St Germain against Metz years ago. Damn lazy Prima donna that is what he was. Don't like him, never have, never will. Not worthy of being in the same paragraph that mentions Cantona or Keane et al.